Q: HELP! iPhone screen stays black. A black screen of iPhone issue is usually caused by system problems, app crashed, or hardware fault on iOS device. If your iPhone remains black and does not respond to your gesture on the screen, don't worry, this article here is going to show you 3 ways on how to fix iPhone black screen of death issue step by step. Note: Before all the below solutions, please make sure that your iPhone has been fully charged, for sometimes it seems that your iPhone gets black screen issue but in fact your iPhone just lacks of enough power to turn on. Whatever problem your iPhone has, the first method you can try to fix it is to force restart your iPhone. Sometimes it works, and it will not damage your iOS device. Now you can follow the instructions as below to remove your iPhone black screen. > Please press and hold simultaneously the Power button and Home button on your iPhone till the Apple logo shows on screen. > Then release the Power button, and your iPhone will be rebooted automatically. > Check if you can operate your iPhone normally or not. To fix iPhone black screen of death, you can also restore your iPhone through iTunes. However, please make sure you have backed up all your important data from your iPhone via iTunes to restore iPhone with the iTunes backup. And during the process, iTunes will erase all data and settings on your iPhone to fix your iPhone. Now, you can start to fix your iPhone black screen issue. > Firstly, get a USB cord to link your iPhone to computer and launch iTunes on computer. Note: Please ensure that the latest iTunes has been installed on your computer. If not, please go to Help > Check for Updates on iTunes to get a latest one. > Secondly, click the iPhone icon on iTunes, then hit the Restore iPhone option on the right panel on iTunes window. > Finally, confirm your action to restore your iPhone on the pop-up window. Then iTunes will start to erase all data and settings on your iPhone, download and install the latest iOS version on your iPhone. Finishing the process, your iPhone black screen issue will be fixed. Hard reset iPhone does not work? Or you don't have an iTunes backup before your iPhone gets black? Or you are worried the operations is too difficult or your iPhone data will be damaged or lost? Then you might directly turn to this method to fix remove your iPhone black screen. 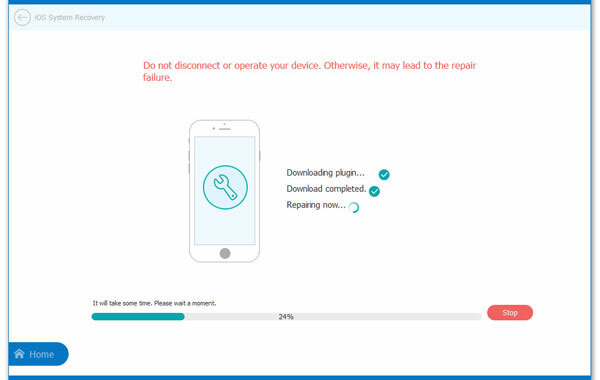 Here, it is strongly recommended to ask for help from a professional iOS rescue tool - iOS System Recovery to fix your iPhone error. This tool specializes in fixing all types of system problems on iPhone/iPad/iPod. You can easily operate the program and quickly fix different problems like stuck on Apple logo, iPhone error 9006/53/56, iPhone stuck on recovery mode, iPhone blue/black/white/red screen of death and so on. Now, just download the software in Mac or Windows version on your computer, and then follow the guide to remove your iPhone black screen step by step. After installing the software in right version on your computer, run it and make your iPhone connected to PC with a USB cable. Then you might switch to "More tool" > "iOS System Recovery" on the main interface of the software. The software will automatically detect your iPhone for possible system problems, and show them on the program, such as Black screen of death, Stuck on Apple logo, Recovery mode, iPhone Error 9006 and etc. Simply hit the "Start" button to move to the next step. In the end , you will be required to confirm your iPhone information. If it is right, just hit "Repair" option to begin repairing iPhone black screen issue. If not, just select the right one and continue to hit "Repair"option to start the fixing process. To fix iPhone black screen issue, the program will automatically detect your iPhone's current iOS version and then download and install the latest one on your device. When the whole process is complete, your iPhone black screen issue will be resolved immediately. iPhone Red Screen of Death? 3 Solutions to Fix It! iPhone Stuck on Verifying Update? 4 Methods to Fix It! iPhone Keeps Freezing? 6 Methods to Fix It!